Advancements in assistive tech and interactions with industry professionals help students with blindness pursue interests in STEM fields. Mariah Maryman, a 10th-grader at Kennedale High School, southeast of Fort Worth, Texas, has never let her visual impairment get in the way of speaking up for herself and her needs in the classroom. But with coding and other STEM skills now playing a more predominant role in the curriculum, blind and visually impaired students, such as Maryman, require a range of accommodations to be able to keep up with their peers and imagine themselves pursuing careers as computer scientists or engineers — support that might not be available during the summer months when school is out. That’s where Level Up comes in. A project of Wichita, Kan., based Envision, Level Up is a summer camp where visually impaired middle and high school students learn how to use screen readers, magnification software and other forms of assistive technology. Students also work on social and living skills so they can be more independent in regular classrooms and advocate for themselves in college and eventually the workplace. During the school year, DeHoet works with students on how to use Non-Visual Desktop Access, a free downloadable program that has made screen reading more widely available to visually impaired children and adults. Some students with no vision use Braille readers. She helps them become comfortable with the technology so they can participate in class, even without the assistance of a paraprofessional. But she also nominates them to attend the camp so they can “continue learning over the summer, access critical information, and engage with the world,” she said. Level Up began in 2006 with some refurbished computers and about four high school students from the Wichita area. Now students are coming from at least seven different states for a week-long residential experience, held at Butler Community College for middle school students and at Wichita State University for those in high school. While iPads can enlarge coding text and symbols, screen-reading software can isolate individual characters in the code so students can program robots or create music, for example. In addition to the basics of coding, students are also learning about career pathways and interacting with STEM-related researchers and industry experts. Hashim Syed, who will be in 10th grade this fall in the Wichita district and participated in Level Up this summer, says he now uses his laptop more because he has learned shortcut keys that can help him find information quicker. But he also enjoys interacting with blind people working in STEM fields “to see what other people’s lives were like,” he said in an interview. And he enjoyed meeting students from Colorado, Washington state and Delaware. Being on the WSU campus has created opportunities for Level Up to work in partnership with researchers and college students. For example, Gary Brooking, the chairman of the Department of Engineering Technology, and some of his students, lead coding activities with the participants. This year's challenge was to assemble a robot that would pop a balloon on the back of an opponent's robot, using an Arduino controller. "Programming and debugging code was often a challenge, as the code development program did not always work in the narrative voice, and so very difficult for sight-impaired students who rely on audio feedback," Brooking said in an email. "The WSU students and instructors would help in these situations, however, as the campers often found very ingenious ways to solve their problems and help each other." Students in WSU’s College of Education, who are returning to school to earn a special education endorsement, work with Envision and Level Up to learn how to work with students with special needs. These growing partnerships “have given us a strong foundation so we can approach different areas within the college,” Hannah Christenson, a support program coordinator at Envision, said in an interview. Professionals from the business community also participate in a career fair and spend time with students discussing career opportunities, benefiting both the students and the companies, added Bonnie Cochran, Envision’s director of support programs. Industries represented this summer include technology companies, a child development center and an event space. 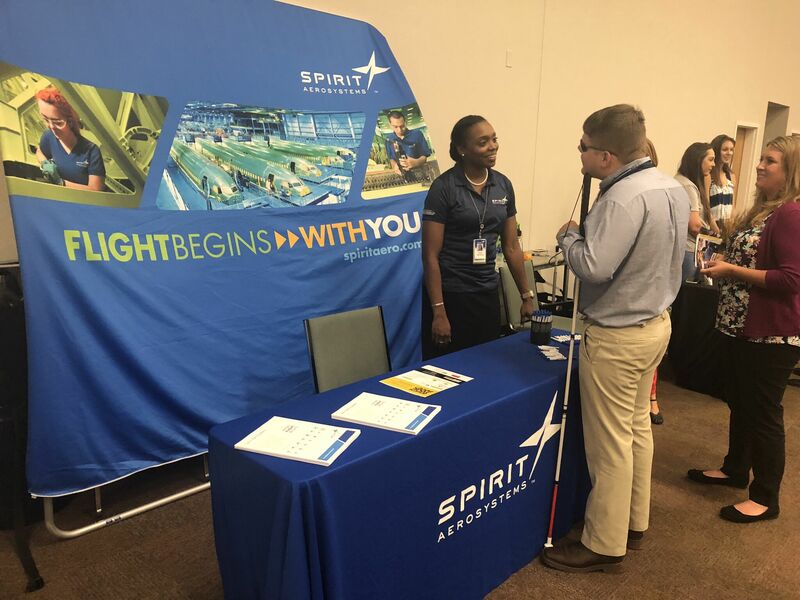 Spirit AeroSystems, a Wichita-based aircraft manufacturing company, participated in Level Up's College, Career and Resource Expo. According to the American Printing House for the Blind, more than 62,500 K-12 students are legally blind. And while there are over 7 million adults in the U.S., based on data from the American Community Survey, less than 5% of professionals in STEM fields are blind. “This presents a missed opportunity to increase the representation of many underrepresented populations (including those with disabilities) in areas such as STEM,” Idalis Villanueva and Marialuisa Di Stefano of Utah State University wrote in a 2017 study on the National Federation of the Blind’s (NFB) efforts to increase blind students’ access to STEM learning opportunities, specifically its Engineering Quotient program. They added that the low representation of blind people in the STEM workforce is likely discouraging to blind students in high school who are beginning to think about college and career pathways, especially if they feel a lack of support from parents and educators. The researchers learned that modifications in lesson planning and an understanding of how a blind person uses other senses to interact with materials in the classroom can increase students’ interest in STEM subjects. They added that “secondary education instructors are in a unique position to allow or prevent these opportunities from occurring in their classrooms.” Using a Universal Design for Learning approach can also benefit other students — who may or may not have disabilities — in STEM-related classrooms. During the summer, Level Up is just one of a growing number of efforts to make STEM fields more widely accessible to students with no or low vision. Since 2013, NFB has had funding from the National Science Foundation (NSF) for a variety of youth STEM-related programs through its National Center for Blind Youth in Science initiative. The organization received another $2 million NSF grant this year for its engineering program. In fact, after she participated in the Level Up high school camp and worked as a mentor to a student in the middle school program, Maryman went to Baltimore for a week to learn about biomedical engineering through the NFB program. Also this summer in Arizona, 10 visually impaired middle and high school students from across the state, participated in Project POEM (Project-Based Learning Opportunities and Exploration of Mentorship) at the University of Arizona’s Mt. Lemmon SkyCenter. Also funded by NSF, the 14-month project will continue through the school year as the students receive materials to help them in the classroom and are paired with two mentors — a university student in a STEM major and a visually impaired adult working in a STEM field. For Maryman, Envision has “helped me find that bridge point” to using a laptop more on a daily basis. And she expresses confidence in the opportunities awaiting her.